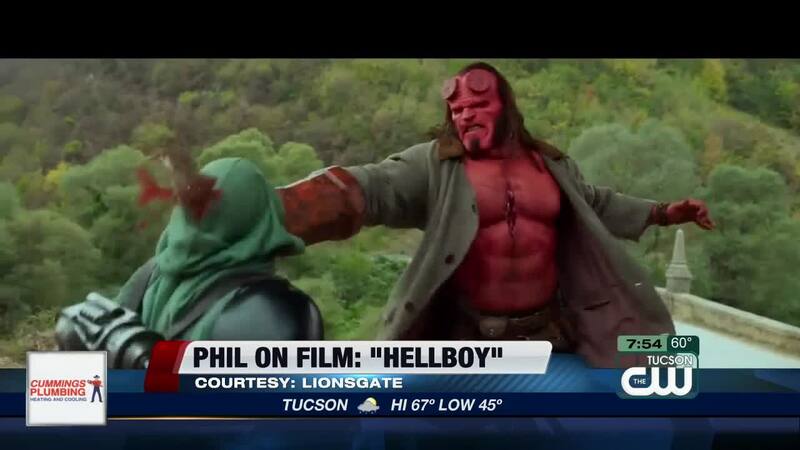 Like the demon-spawned antihero himself, "Hellboy" can't keep from getting in its own way. The red-skinned, hot-tempered beast played by David Harbour is given to fits of hyperaggressive outbursts that cause horns to spout out of his head. After a flurry of overreactive devastation, Hellboy tends to regret the damage he caused, wondering where it all went wrong. That must be what it feels like for the creative team rebooting the Dark Horse comics franchise. Although better-looking and more authentically dark than Guillermo Del Toro's 2004 and 2008 "Hellboy" movies, the new film lacks the heart of the earlier efforts. Director Neil Marshall ("The Descent," "Doomsday") brings his usual visually dazzling touch to the material, replicating the look and feel of the comic books with a mix of stunning practical effects and CGI. At times, Marshall is maybe a little too faithful to the source material in the looks department, sticking to distractingly odd, genie-like visages of dead characters that amount to floating heads awkwardly attached to a sloppy, fake ghost body. The cliched story does the production no favors. Hellboy, who works for a covert paranormal activities investigation bureau, is still finding his way as a justice-dealing vigilante. He finds himself on a video game-like quest to hunt down and destroy an ancient queen (Milla Jovovich), who looks to seduce him and usher in the apocalypse. The best moments come in the father-son relationship, with the hardscrabble Trevor (Ian McShane) dealing out tough love and harsh advice to the creature he raised since demon boyhood. Harbour nails the tragicomic, sardonic nature of the character, but there's only so much he can do with a script of coarse one-liners and throwaway expository dialogue. With world building aplenty, as well as an industry-standard mid-credits scene that points to future installments in the franchise, there's an almost sad effort to re-establish the "Hellboy" franchise, making way for future sequels that may not come along if this film flops as expected. With more going for it than you might expect, "Hellboy" isn't as awful as its wretched Rotten Tomatoes score makes it out to be. But when the highest compliments the movie can elicit are the damnation of faint praise, this is a film destined to wallow in purgatory.